Tables are flat. Do relational database tables leave you flat too? You can get much more power from a structured database. Graph databases have arrived. Relational databases (RDBMS) were conceived to digitize paper forms and automate well-structured business processes, and they are still extremely relevant today. But, many companies are choosing to explore other database options to solve some of their biggest challenges. Relational databases are still the foundation of many modern mission-critical applications. They allow us to store highly structured data–and lots of it. 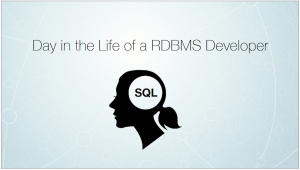 However, when you utilize that data in today’s enterprise environments, RDBMS can come up a little bit short. Capacity is critical, but having sheer volume without relevant data connections is like eating an ice cream sundae with no spoon. The relationships that connect data points is where the value lies for many of today’s use cases, including fraud detection, network monitoring and security, recommendation engines and master data management (MDM). Relational databases cannot model or store these data relationships without adding debilitating complexity and the resulting performance degradation. Graph databases are, in a way, the next generation of relational databases. While they store massive quantities of data, they consider the connections between the data points as equally as important. These data relationships are stored inherently, virtually eliminating the need for complex queries as well as the associated latency. The ability to model and store your data the same way you would if you were drawing it out on a whiteboard is what allows graph databases to provide such a critical competitive advantage. If you can manually detail your data and the associated connections, you can model it as a graph. For this reason, graph databases are simultaneously more simple and yet also more expressive. Now, how do graph databases actually compare to relational databases in terms of speed and agility? What are the differences in query languages and deployment methods? Register for our upcoming webinar and we’ll show you all the details! Join us for this webinar on Wednesday, March 9th at 10:30 PT (19:30 CET), to learn why companies are shifting away from RDBMS and towards graph databases in order to unlock the business value in their data relationships. Ryan Boyd is a SF-based software engineer focused on helping developers understand the power of graph databases. Previously he was a product manager for architectural software, built applications and web hosting environments for higher education, and worked in developer relations for twenty products during his 8 years at Google. He enjoys cycling, sailing, skydiving and many other adventures when not in front of his computer. Published at DZone with permission of Corie Brickman , DZone MVB. See the original article here.